Following on from my Conference Premier prediction, it is now time to turn the focus onto Step Two. Which clubs can take the titles in Conference North and South, and with it a place at non leage’s top table? 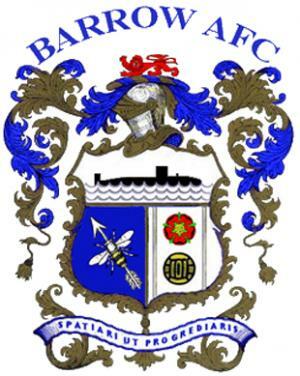 My tip for the Conference North title is Barrow AFC. Under manager Darren Edmondson, the club have made good progress, and the ex-Huddersfield Town and Carlisle United defender has assembled a strong looking squad for the new campaign. The most notable signing is probably that of striker Anthony Wilson, who scored twenty league goals for North Ferriby United as they finished second in their first ever season at Step Two. Another potential star signed is James Ellison. The 22 year old striker came through the youth ranks at Liverpool, but has been somewhat nomadic since leaving Anfield in 2009. Barrow will be his eleventh club in those five years. It’s fair to say that he had struggled to make an impact at any of the previous ten clubs, until he arrived at Colwyn Bay, where he made more than fifty appearances in just over a season and scored fifteen goals. If he settles into life in the North East quickly, Edmondson may have unearthed a gem. It’s not just in attack where Edmondson has strengthened though. Defender Danny Livesey has joined the club after spending the second half of last season with my Premier tip Wrexham on loan from Carlisle United. The 29 year old is something of a legend at Brunton Park, spending almost ten years at the club and making more than three hundred appearances. He also captained theside. His experience will be key for Barrow this season, and at a still relatively young age, is a fantastic signing. Everything seems to be in place for The Bluebirds to have a real crack at the title next season, and the fact that they are currently the bookies’ favourites bears that out. In the South, it was an easy pick for me. I’ve gone for Bromley FC. Just a look at the news section on their website shows how much they’ve been up to in the close season. Record season tickets and a whole host of quality signings mean Mark Goldberg’s side are rightly the clear favourites for promotion. Goldberg seems to have strengthened every area of the squad, and every position on the pitch. In goal, ex-AFC Wimbledon favourite Seb Brown has joined. Brown, you may recall, was a hero in the Conference playoff final against Luton Town back in 2011, saving two penalties in the shootout to help The Dons into the Football League. He spent part of last season on loan at Woking, but has joined the revolution at ambitious Bromley following his release from AFC. The defense has been added to, with Adam Bailey-Dennis rejoining the club for the new season. Bailey-Dennis spent the latter part of last season at Hayes Lane, and the former Colchester United, Braintree Town and Bury Town man obviously feels he is at the right club at the right time. In midfield, Goldberg has really pulled off some great looking signings. Moses Ademola, Dean Sinclair, and Damian Scannell all add quality and experience, whilst upfront there have been some fantastic additions, mainly Sam Higgins from East Thurrock United, and ex-Tottenham Hotspur and Chelmsford City man Jamie Slabber from Sutton United. I’ve seen both players play live, and they should be cracking additions to the squad. It may not have always been the most stable and harmonious club internally over the years, but things have really improved. Goldberg is now going into his fourth season in charge – in his third spell as manager. That sort of stability shouldn’t be ignored, and coupled with the new signings, things are looking good. If the manager can find a good blend, and keep everybody happy, I can honestly see Bromley FC running away with Conference South this season. What do you think about my predictions for Step Two? Do you agree, or do you have your own tips for the titles? Get in touch on facebook or twitter (search undertheleague on either), or email undertheleague@gmail.com. Alternatively leave a comment on this post.